Oscars: “The King’s Speech” wins best picture; Colin Firth takes best actor while Natalie Portman is best actress! 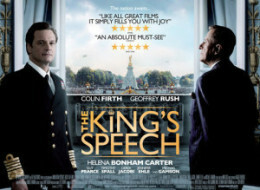 The King’s Speech won best picture at the Academy Awards over a field of nine other contenders at the end of a very predictable Oscar ceremony. The three-hour plus show unfolded quite predictably with the only suspense being which outfit co-host Anne Hathaway would walk out in next. Natalie Portman, the heavy favorite to win the best actress Oscar for Black Swan, and bested a field that included four-time nominee Annette Bening who was nominated for The Kids Are All Right. Also in the category were Nicole Kidman for Rabbit Hole, Michelle Williams for Blue Valentine and Jennifer Lawrence for Winter’s Bone. In another expected result, Colin Firth – nominated last year for A Single Man – took home his first Academy Award as the winner of best actor for his performance in The King’s Speech. I have a feeling my career’s just peaked,” said Firth who confessed that he was having to fight off the impulse to dance before he got off the stage. Firth was the winner in a field that also included James Franco for 127 Movies, Jeff Bridges for True Grit, Javier Barden for Biutiful, and Jesse Eisenberg for The Social Network.